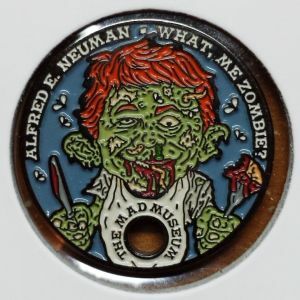 Available for purchase here with PathCash, or directly from my website www.theMADmuseum.com for $5(cheap!). If you think you may have a tag that is of interest to me, add this to your wishlist and show me what you have! 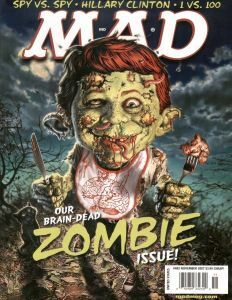 Alfred E. Neuman is the mascot, poster child for MAD Magazine. 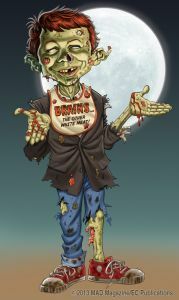 This pathtag design was based off of the Zombie cover MAD #483 November 2007 by one of MAD’s insanely talented cover artists Mark Frederickson. 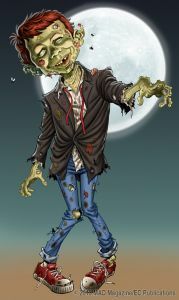 Tom Richmond is another talented artist for MAD who recently this Halloween made his own rendition of art based on Mark's cover, his two pieces of art are shown below in the additional pictures.